Social Network Giant has all your details in its database whether you are graduated from school or bought a brand new bike, everything is stored in Facebook via your Facebook account Timeline. You may think it is an exaggeration, the fact is Facebook has all your life such as Photos, comments, like and updated etc. The Spoken words could be forgotten in some day, but Facebook forgets nothing. So If you want to deleted something from your Facebook profile, you have to delete it manually by loading the timeline posts again and again. It is waste of time and think about that if you are the addictive user of Facebook for 4 to 5 years, you need a day or month to delete your unwanted content from your Facebook timeline. So that SimpleWash has been created to remove all the unwanted content from your Facebook Account. Previously I’ve Shared the service called “FaceWash“. They have now changed their name to SimpleWash and added more features. Simple Wash is a free online service that works as a Facebook app by integrating with your Facebook Account and finds the inappropriate content from your Facebook Account. When you enter the SimpleWash home page, you can sign in to the SimpleWash via your Facebook Account. Also, there is an option to sign in via Your Twitter account. Basically, the SimpleWash worked based on certain keywords. When you first login to it and click the Start washing button, the search will filter the unwanted contents from your Facebook timeline with default keywords like s*x,p*rn, M*rder and something related to that. You have the option to change the language of the SimpleWash straight from the menu. Currently Supports English, French, German, Italian, Spanish. Change of language is helpful to load their predefined keywords to filter out your Facebook profile. See the screenshot below with the default search. 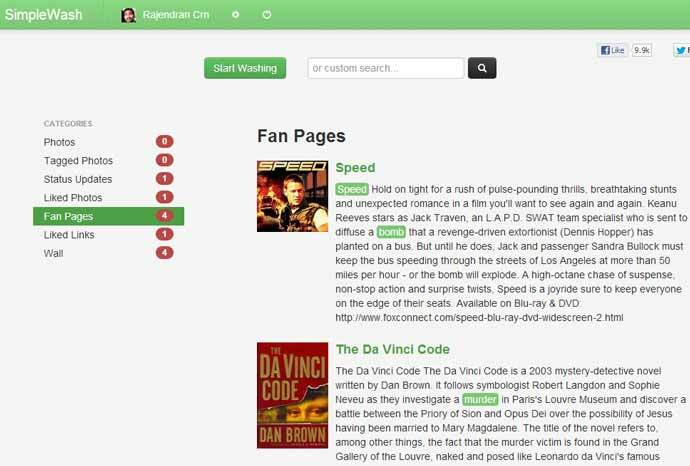 The search results will be splitted into different categories like Photos, Status updates, Walls, Fan Pages and liked links etc. So you can easily remove the unwanted contents from your Facebook Account by using those categories. To remove the content, just click the link in the search result, it will directly open in your Facebook account, there you can change that particular post or you can just remove it. 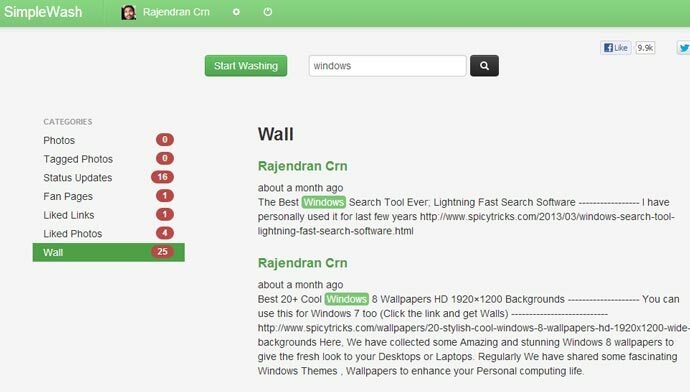 Finding the undesirable content from you Facebook account is the main functionality of the SimpleWash. It is all up to you delete or change the content in your Facebook Account.